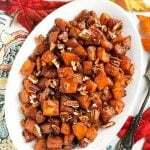 Cinnamon Roasted Butternut Squash is a delicious side dish recipe that is perfect for Thanksgiving, or any holiday. The warm spice of the cinnamon and caramelized brown sugar compliments the oven baked butternut squash. A tasty vegetable side dish! Sometimes it’s difficult to figure out what to do with a butternut squash once you get one. The most popular recipe to make is a Butternut Squash Soup. 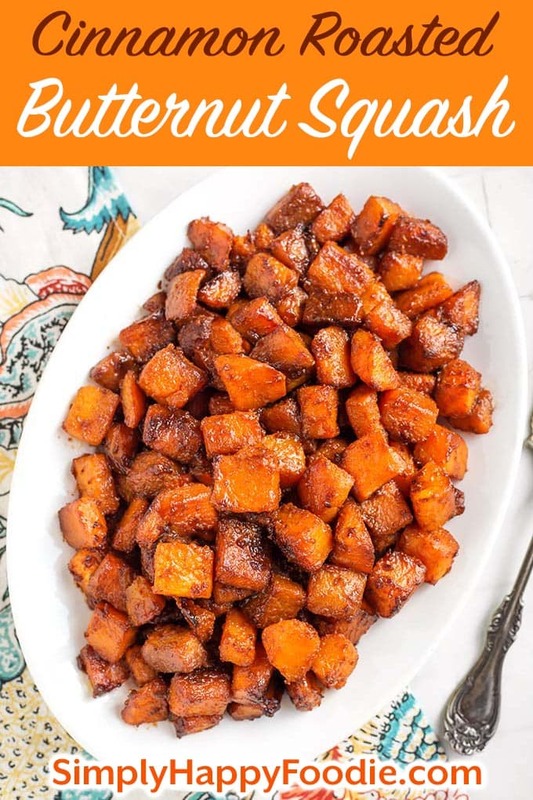 There are so many other yummy ways to prepare this winter squash. Butternut Squash is a versatile squash, and when roasted in the oven it becomes even better. You can make a puree and add that to everything from pancakes and muffins to pasta sauces and smoothies! 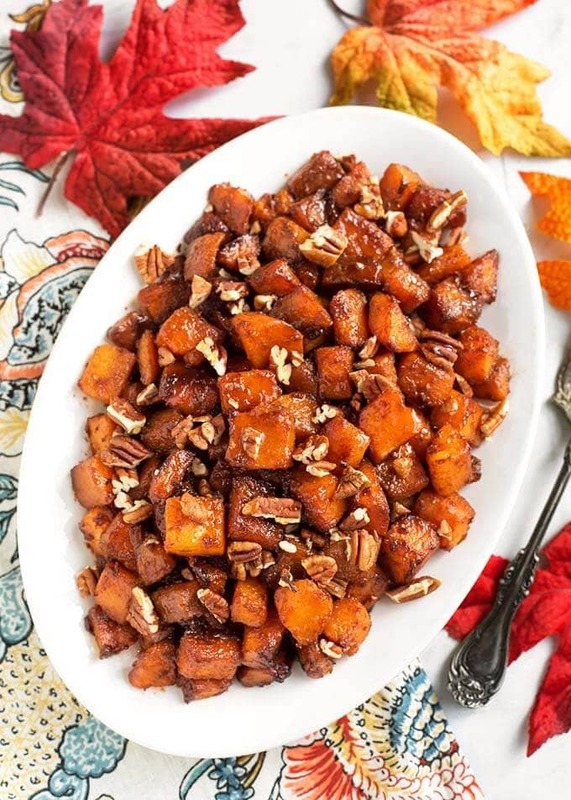 Cinnamon Roasted Butternut Squash is a sweet side dish, with the wonderful flavor of cinnamon. It’s not overly sweet, and can hold its own at the dinner table alongside whatever else you happen to be serving. The most difficult part of making this recipe is cutting up the squash into the cubes. Butternut squash are solid! One way to soften them up a bit is to pierce them several times with a sharp paring knife and put the whole squash in the microwave for about five minutes. This won’t cook it, but will help it soften up so you can cut it easier. Roasting the cubed butternut squash in the oven at a high temperature makes the edges get a little dark and helps the sugar caramelize. That caramelization enhances the flavors. I like to garnish with some chopped toasted pecans and a drizzle of maple syrup for that extra special touch. 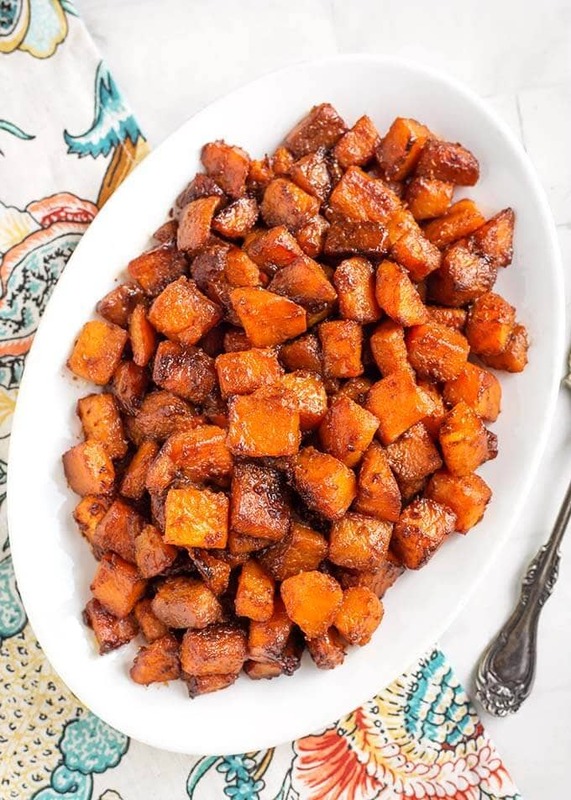 Cinnamon Roasted Butternut Squash is delicious recipe with the warm spice of cinnamon and sweet caramelized brown sugar. A perfect Thanksgiving side dish. If your butternut squash is not precut, you will need to peel, deseed, & cube it. It helps if you pierce the squash with a knife a few times & then put the whole squash in the microwave for 5-6 minutes. just long enough to soften it for cutting. Heat oven to 425° (F). In a mixing bowl, add the brown sugar, salt, cinnamon, pepper, and melted butter. Whisk together well. Add the squash cubes to the mixture and toss to coat all of the cubes. Spread the squash cubes out on a parchment lined baking sheet in a single layer. Try to separate them as much as you can. If you need to, use two baking sheets. The cook time will depend on how large you cut the cubes, and whether or not you had to microwave the squash a little to soften it for peeling. Just keep an eye on them. Bake at 425° for 15 minutes and then check on them. If you want, you can stir them and put them back in until done, another 5 to 15 minutes (cook time will depend on how large the cubed butternut pieces are). 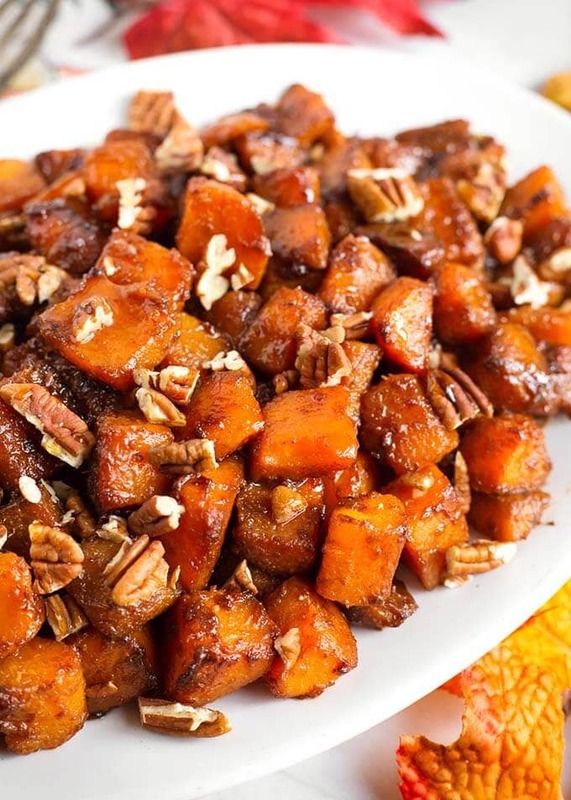 Remove to a serving dish and garnish with chopped toasted pecans and a drizzle of maple syrup.